Lane Hedeman and Bridget Meyer tied the knot! Bridget Meyer, owner of Hippie Alice, married Lane Hedeman in a whirlwind of fringe, turquoise, and bohemian flair! 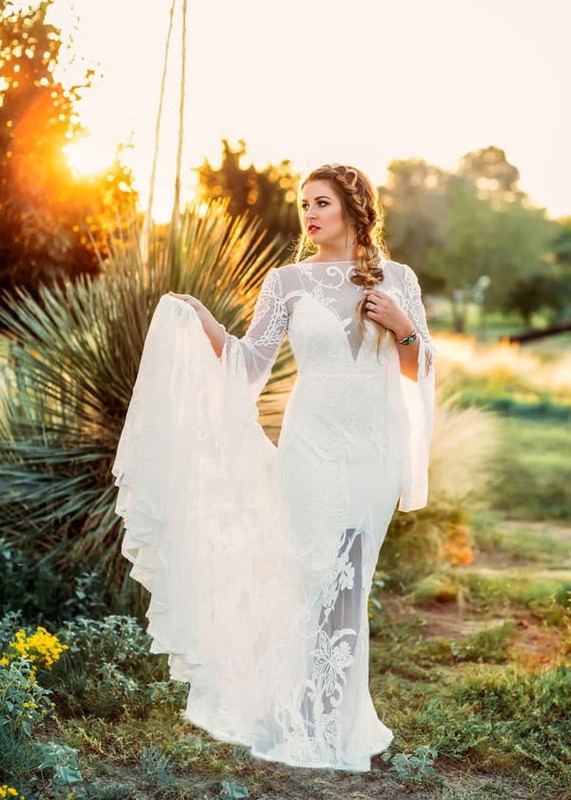 If you know Bridget, her bridals are nothing short of expected when it comes to matching this Marfa shoot to her hippie flower child style and personality. “”Lane learned from an early age watching his mom and the other women on the rodeo trail and at the finals every year never to ask a women, “Are you wearing that?” because the answer is always yes and she might just throw on an extra layer of leather, fur, or fringe if you do ask! He has always supported my taste in fashion and doesn’t mind standing beside me even when I’m positive he thinks I look like a rodeo clown. “When Lane and I met at the National Finals in 2013, I was wearing a solid sequin dress and fringe boots, so he has known from the beginning that I wasn’t very traditional in my attire and he knew my wedding dress would be no exception to that rule. “When I picked my dress out, I knew I wanted something different and I wanted something Lane would love. I went with a solid white lace, floor length, long sleeve for the “traditional” factors, but the fringe and intricate detail, low back and sheer chest for the WOW factor. “The turquoise earrings I wore were borrowed from my best friend, and the turquoise bracelet I wore was a gift from Lane from Albuquerque for my birthday the first year we were dating. And I wasn’t surprised in our first look to find out Lane loved it too, although I think he would have said he loved it even if I was wearing a feed sack. Want more weddings? Scroll below! Paige Duke Married King Of The Cowboys, Ty Murray!